John Elway was a gifted passer who played quarterback with a toughness rarely seen at the position. His cerebral approach to the game helped him make the most of his talents. It also made game-planning extremely difficult for the opposition. Drafted as the #1 overall pick out of Stanford in 1983, Elway is one of only three quarterbacks to be selected first and reach the Hall of Fame (joining Terry Bradshaw and Troy Aikman). A two-sport athlete at Stanford, Elway excelled at both baseball and football. He was selected by the New York Yankees in the amateur baseball draft and played two seasons of minor league ball. When the Baltimore Colts drafted him with the #1 pick, Elway threatened to sign a pro contract with the Yankees unless the Colts ownership agreed to trade him. As they say, the rest is history. Despite three prior trips to the Superbowl, it wasn't until 1998 that Elway finally raised the Vince Lombardi Trophy. He followed up in 1999 with a second consecutive title, becoming the oldest quarterback to do so. He was also named the Superbowl MVP. The nine-time Pro-Bowler was enshrined at the Professional Football Hall of Fame in 2004. 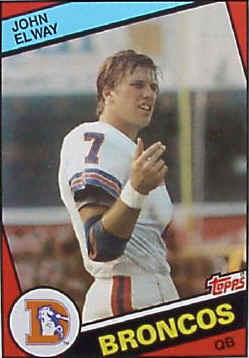 A truly iconic set that managed to just escape the junk-wax era of over production, this is Elway's definitive rookie card. The candid photograph, with a helmet-less Elway, and diagonal layout makes for a distinct and memorable card. While not a card, these stickers were quite popular at the time and should be included in any rookie card analysis of Elway. The stickers are notorious for being mis-cut and off-center, making high-grade examples rare and relatively valuable for a sticker "card." 1995 Pacific Prisms Royal Connections John Elway #RC-4a Broncos Tough Find! You forgot to display his minor league 1982 TCMA Oneota Yankees card. Classic card and his only baseball offering. 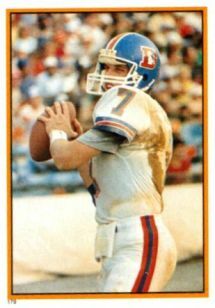 Although a neat minor league card, the guide is intended to focus solely on Elway’s rookie football cards. What is a comple set of 1984 topps football cards work.